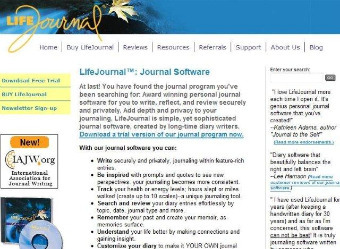 LifeJournal has created a system for the more technologically savvy journal software that can be used to write, reflect and keep family histories etc. in a secure fashion. This software is perfect for the person who spends many hours behind the laptop or in an office environment. You have the ability to organise your thoughts, feelings and reflections just as you would in a regular journal with the added benefits of finding text and passages previously written quickly and easily. You can search journal entries by date, topic, word, and journal type. It comes fully password protected and encrypted to ensure your privacy. LifeJournal is easy-to-use, private, secure, comprehensive, organised and innovative. It will add new heights to your journaling experience making it deeper and more enjoyable. Use it as a stand alone journal or in addition to your paper versions. Download a trial version now. Effortlessly organize your thoughts and feelings for further reflection and understanding, journaling often, and learning more from your diary. Our journal software takes you beyond paper journaling or even other personal journal software, so you can easily see your life more clearly. Customize your journal to make it YOUR OWN journal program. Choose color themes, add prompts and quotes, choose up to 10 scales to track, and more! Write securely and privately, journaling within feature-rich entries. Enjoy writing naturally without changing your writing process. Be inspired with prompts, quotes, and experts' wisdom to see new perspectives: your journaling becomes more consistent.. Understand your life better by making connections and gaining insight. Remember your past as memories surface. This could be the first step to creating your memoir, or a way to simply keeping track of past events. Search and review your diary entries effortlessly by topic, date, journal type and "Daily Pulse". Here's where LifeJournal is really powerful. Journaling Prompts: All About Me.